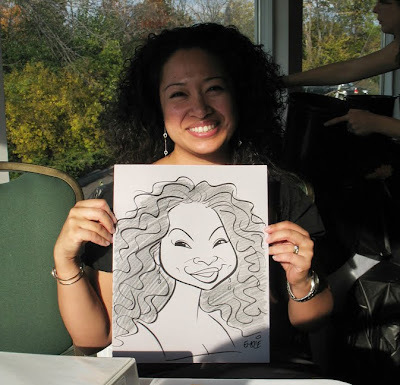 I still quite enjoy doing "Party Caricatures" at various events, whether they be corporate events or smaller private parties. 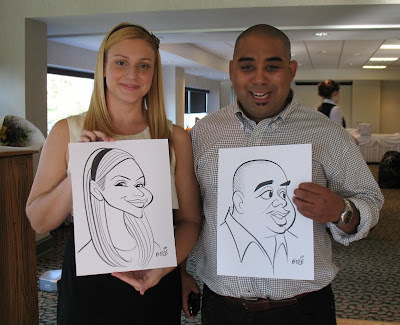 Today I was hired to draw at the bridal shower of Carole Ratulowski and her husband-to-be, Ollie (who wasn't allowed to show up until the end, poor guy!). The happy couple are pictured in the first two photos, with several of the guests pictured after them. I wish I'd taken a lot more photos, but I'd forgotten I'd brought my camera until I was well into drawing them. Unfortunately, by that time I was also having problems with the bright sunshine streaming through the window playing havoc with the balance of the lighting. 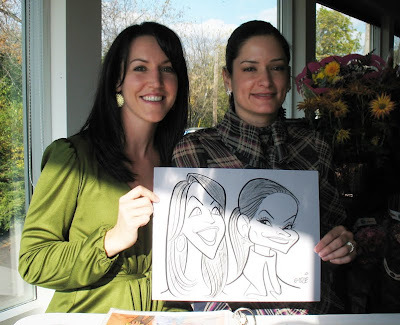 I've adjusted several of them to lighten the guests, while keeping the caricatures as untouched as possible. I'm afraid I'm no photographer! 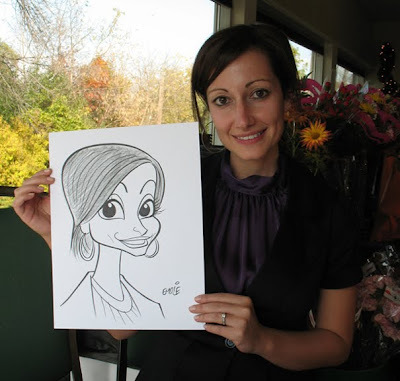 This last young lady was so pretty - somewhat reminiscent of Audrey Hepburn with her big eyes and angular little jawline. The following three pics are of Lesley and Peter Skingley and their son Connor. 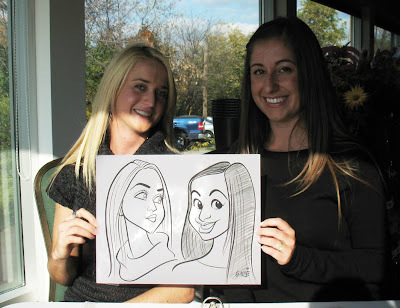 I'd sketched at Peter's birthday shindig about a month ago. 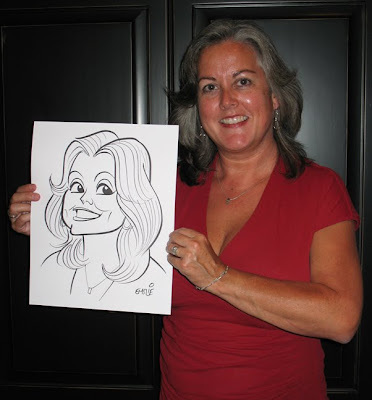 I am certainly open to drawing at any events in the Toronto and Mississauga area, so for those in the GTA who might be interested in booking me for upcoming events, please email me for rates and availability. Remember, Christmas is coming up soon! This morning I awoke to the very sad news that singer Al Martino had passed away at the age of 82. Though I am grateful that he enjoyed a long and happy life and career, I am personally saddened because, of all the legendary Italian American crooners that I've long admired, Al Martino was the only one whom I'd actually had the pleasure to see several times in concert and meet in person. Al Martino had been very successful starting from the 1950s, and particularly through the 60s and early 70s, with a string of song hits including Here In My Heart, Spanish Eyes and Volare. However, as many of my generation probably were, I was initially most aware of Al Martino from his film performance in The Godfather, where he played Johnny Fontane, a singer with movie aspirations clearly modeled on Frank Sinatra at the time Sinatra was fighting for the role in From Here To Eternity. Because the movie (and the original novel) depicted Fontane as having influential friends within the mafia, Frank Sinatra was none too happy with either the character or with Al Martino for playing the role. I gather that Frank held a grudge against Al ever since that time. But in the years after The Godfather, I became a big fan of Al Martino, just as I loved all of those legendary Italian American singers like Sinatra, Dean Martin, and Bobby Darin. In fact, when my fellow highschoolers were all grooving to such 1970s newcomers as Elton John and Billy Joel, one of my favourite songs from the pop charts of that era was Al Martino's To The Door Of The Sun. 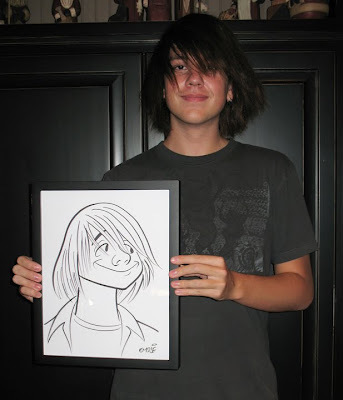 Yeah, I was a weird kid, always with tastes that were more in keeping with my parents' generation. I remember the way Al Martino looked at that time, with the huge sideburns and mane of black hair, very similar to that of his contemporary and longtime friend, Engelbert Humperdinck. 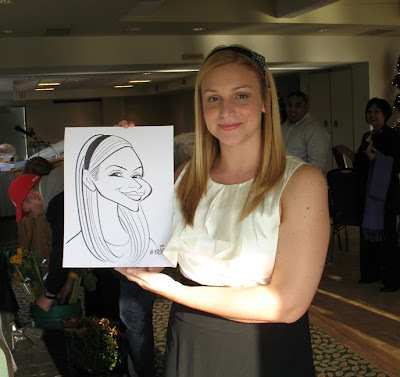 It was this look which I decided to capture in the above caricature. 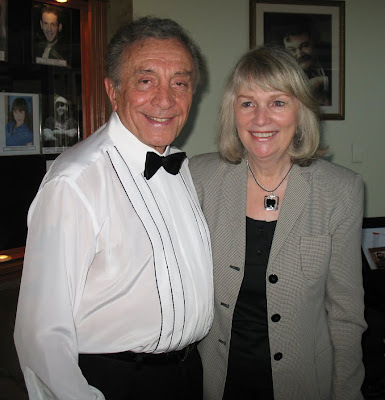 What a wonderful surprise I got when my husband, Al Martino, came home from his recent tour of Canada. 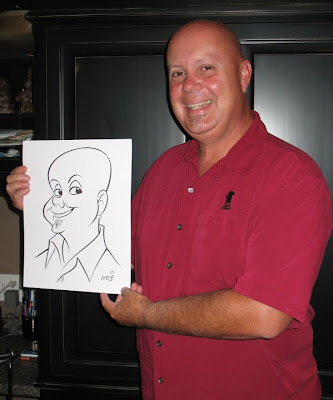 There was a fantastic caricature of him that you had done. You definitely captured him and I absolutely LOVE it. I have gotten so much pleasure out of seeing it. Al has a studio here at our house and it now is very proudly displayed. We both thank you for your kindness. And what a talent. You have made our world a much happier place. God Bless You. On the next visit, Judi accompanied him on tour, so I went up to say hi when I saw her in the lobby before the show chatting with the concert promoter. She was so sweet and insisted that I come back to see Al again after the show. 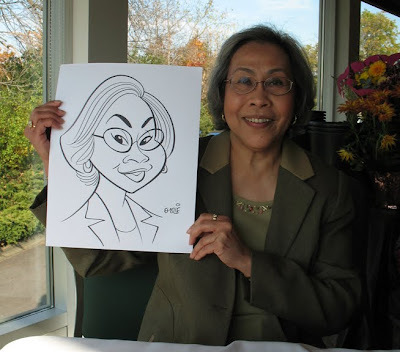 When I saw them in the lobby later, Al happily greeted me and again expressed how grateful he was to me for doing his caricature. They were both such lovely people that I asked if I could take a photo of them together, which you can see pictured above. 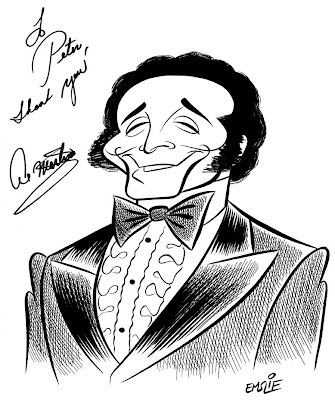 Al Martino was such a wonderful entertainer with that rich operatic baritone, and he was also a real gentleman. I will personally miss him so much, but am grateful for having had a chance to meet him several times. My sincere condolences go out to Al's wife Judi and their family. Here are a couple clips to enjoy of Al Martino in performance. The first, singing his big hit, Spanish Eyes, and the second singing a song he recorded in the later years of his life, the poignant tale of an Italian immigrant first arriving in America, Come Share The Wine. As you can hear in that second clip, Al Martino's voice was still so rich and strong even into his later years. 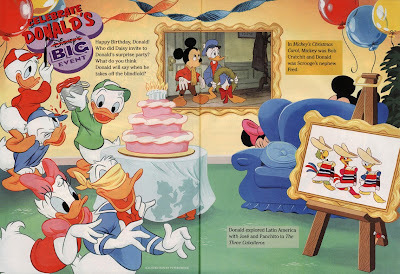 Some More Mickey Mouse Magazine Pages. Once in a while I got to do some illustrations of the characters from the Disney feature films, as some issues would tie in to one that was perhaps being released on VHS at the time. I enjoyed doing the spot paintings above of the Lady and the Tramp characters, although there was something that I took exception to and didn't hesitate to make my argument known. 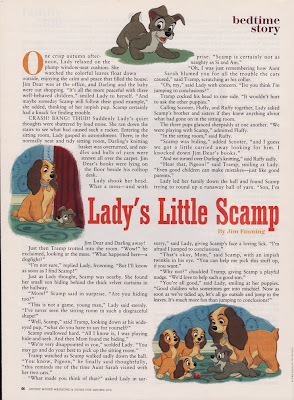 You'll note that in the second column it refers to "Scamp's brother and sisters", which, as every Disney fan knows, is just plain wrong! Scamp had three sisters but no brothers, so I insisted on depicting them exactly as they appeared in the film. While the editors allowed that, they resisted changing the text in the story to match, as I think they wanted to indulge in some political correctness to be more "inclusive" of their boy readers. 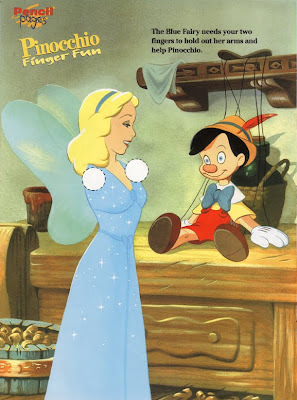 By the way, the writer of the piece was noted Disney historian and author, Jim Fanning, and he wasn't to blame either. I talked with Jim about it afterward and he said he was just as uncomfortable writing it like that too! 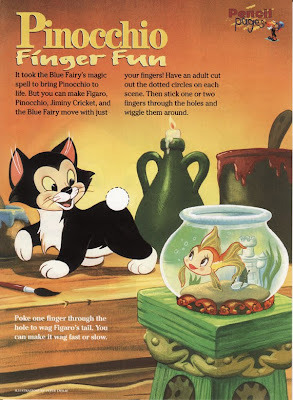 Despite growing up loving Disney animation since I was a young kid, these days I am not particularly enchanted with the company. In fact, I think that when they changed the name from Walt Disney Productions to the more corporate The Walt Disney Company, that signified the beginning of the end for me. 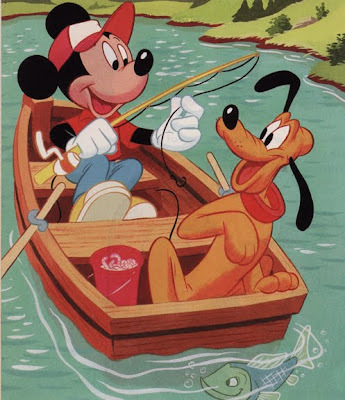 Still, back in the 90s, I must admit I was getting some very good freelance jobs, some from within Disney itself, but mostly from their licensed vendors and publishers. 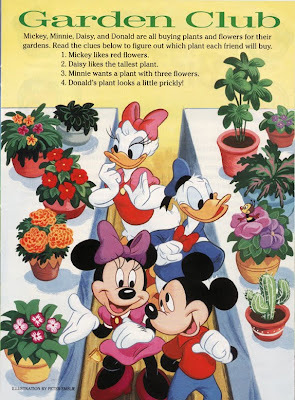 Here are some samples I thought I'd post of various illustrations I had done for The Mickey Mouse Magazine, a very nicely produced publication put out by Welsh Publishing from about 1991 through 1996. 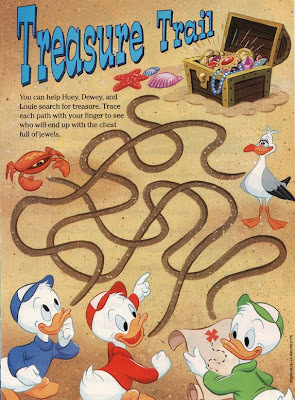 They were also putting out Duck Tales Magazine at the same time, which of course was a tie-in with the popular TV cartoon. I was a regular freelancer on both publications for the duration of their run. The art director I was dealing with on both magazines was a delightfully wacky lady with a sly sense of humour named Margaret Ottosen. Margaret was just wonderful to work with and she would always send her rough layouts to me in envelopes covered with various rubber stamped images cobbled together in amusing situations, just for a laugh. I had a lot of fun on these illustrations, as I got to take each one from rough sketch, through clean-up pencil, to finished painting. All of these were painted in gouache on illustration board. Even if I were to do these today, at most I would only use Photoshop to perhaps paint the characters on a separate layer like an animation cel, but I would still paint the backgrounds traditionally with real paint. Trying to paint in a style as close to the look of the animated cartoon shorts was always my goal. 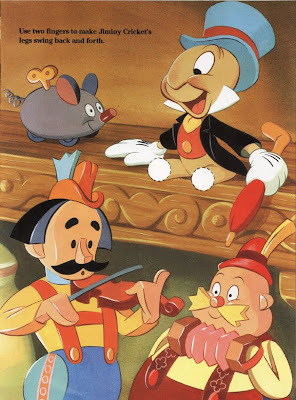 I also liked to include obscure secondary characters from the shorts whenever an animal was called for in a scene, rather than just make up some generic cartoon animal. 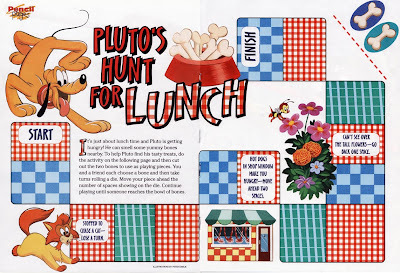 The cat in the above Pluto illustration was from the cartoon, Plutopia. I guess I must like Spike the Bee, as the little rascal snuck into both of the illustrations above! 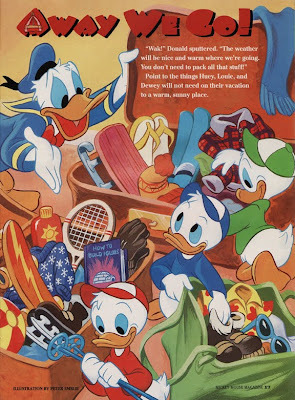 Margaret knew that I had a particular penchant for drawing the Disney ducks, so I would often get assignments featuring Donald, Daisy, and the nephews. 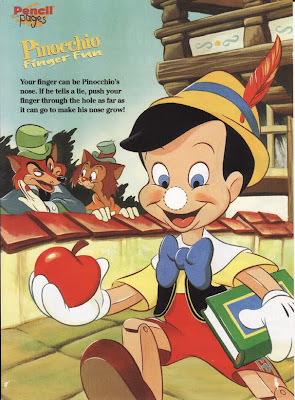 Alas, Disney no longer does much with their standard characters anymore. No longer in vogue in publishing or other merchandising, Mickey and friends have instead been relegated to babysitting the preschool set on the Mickey Mouse Clubhouse series. Additionally, they've been given a bland CG makeover too, as the Disney brass have made it quite clear that they really don't like cartoons.